In recent decades, scientists have devoted a great deal of research to investigate the link between obesity and miscarriage, and it seems fairly clear that weight plays a key role. But does obesity, in and of itself, cause miscarriage? It is a question that many doctors, scientists, and even women at risk struggle with, often blurring the line between what the research tells us and what we assume it to mean. From a research perspective, obesity (defined as a body mass index over 30) is associated with as much as a 67 percent increased risk of pregnancy complications, including miscarriage and recurrent miscarriage. By contrast, other studies have shown that losing weight may reduce the risk of miscarriage in obese women, even among those with a history of miscarriage. Many of the studies have involved women with polycystic ovary syndrome (PCOS), a condition in which women are more likely to be overweight. Even among this cohort of women, there was a clear association between levels of weight loss and rates of miscarriage. As a result of these and other pieces of evidence, the American College of Obstetricians and Gynecologists (ACOG) currently recommends that doctors offer nutritional counseling for obese women who are planning a pregnancy. While the association between obesity and miscarriage seems clearly drawn, it is not entirely black and black. Putting the research into perspective, it is important to remember that the majority of women who are overweight do not have miscarriages. Moreover, obese women who have had have a miscarriage usually go on to have a successful subsequent pregnancy, not unlike women of normal weight. As such, you cannot draw a direct line between obesity as the cause and miscarriage as the risk; it doesn't exist. 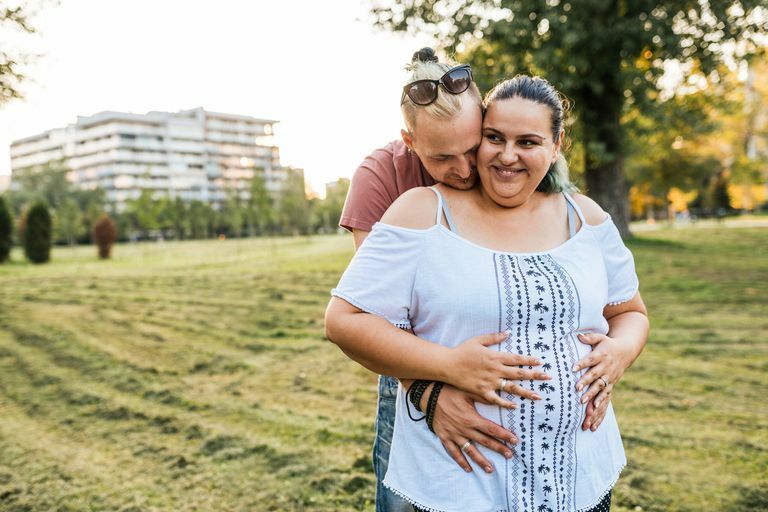 While obesity can compound any number of risk factors associated with pregnancy loss, it may be one of several, significant factors contributing to the loss. It may be because obesity is associated with high blood pressure which can complicate preeclampsia. Or, that obesity can make diabetes harder to manage, increasing the risk of complications in the first 13 weeks. Certainly among women with PCOS, who already run a higher risk of miscarriage, being overweight only compounds an already difficult situation. So does older age and obesity. It is by focusing on these modifiable factors that we can improve the odds. Body weight is a sensitive subject for many women. It is something that many struggles with their entire lives, often facing depression, anxiety, and low self-esteem. Because of this, women with obesity will typically blame themselves for medical conditions that can affect a woman of any weight. Miscarriage is a prime example. If you want to lose weight in advance of getting pregnant, try to do so under the guidance of a doctor or nutritionist experienced in pregnancy. In terms of goals, it is better to approach weight loss as a means to a healthier lifestyle rather than pinning your efforts to a specific number of pounds or dress sizes. By doing so, weight loss becomes part of an ongoing process rather than an event that starts and ends. Yes, there will be ups and down, but, like motherhood itself, it's about the slow-and-steady over the here-and-now. Things like crash diets and rapid weight loss programs may only impede your ability to conceive by undermining the very quality of your eggs, say researchers from the University of Aberdeen in England. Finally, if you are overweight and have suffered a miscarriage, resist the temptation to blame yourself. According to a report from the ACOG, the rate of miscarriages in the U.S., irrespective of weight, can run from anywhere from 17 percent in women under 30 to upwards of 40 percent by the time you reach 40. Sadly, miscarriage can happen to anyone. But, in most cases, a woman will carry her baby to term without complication if she tries again. Focus on your health, and find the support you need to help you through the process. These, along with consistent medical care, will increase your chances of a healthy and problem-free pregnancy. American College of Obstetricians and Gynecologists. "Practice Bulletin No 156: Obesity in Pregnancy." Obstet Gynecol. 2015: 126(6): e112-e126. DOI: 10.1097/AOG.0000000000001211. Bautista-Castaño, I.; Henriquez-Sanchez, P.; Alemán-Perez, N. et al. "Maternal Obesity in Early Pregnancy and Risk of Adverse Outcomes." PLoS ONE. 2013; 8(11): e80410. DOI: 10.1371/journal.pone.0080410. Pandey, S.; Pandey, S.; Maheshwari, A. et al. "The impact of female obesity on the outcome of fertility treatment." J Hum Reprod Sci. 2010; 3(2): 62-7. DOI: 10.4103/0974-1208.69332.